Enterprises – particularly those in the healthcare and defense sectors – have the same need for real-time communications as any other company but differ in the level of security they require. To address this market, one-time Canadian smartphone manufacturer BlackBerry just announced the launch of BBM Enterprise SDK. 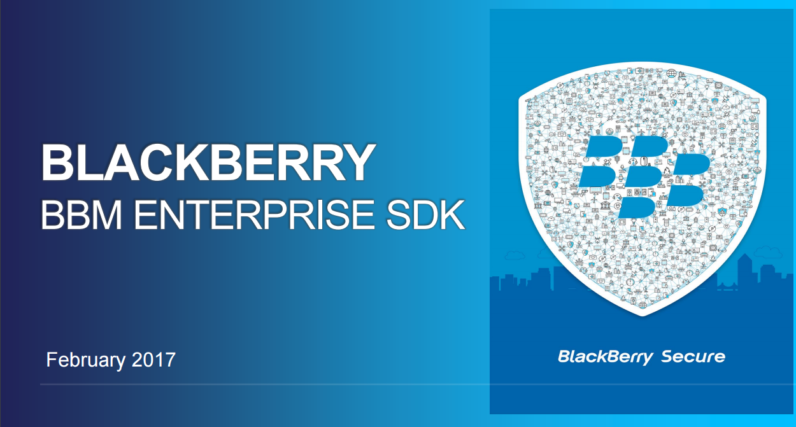 BBM Enterprise SDK promises to let software developers integrate the secure communications features of BlackBerry Messenger into their own applications. These aren’t limited to one-to-one and group chats, although that’s definitely a huge part of it. It also includes voice and video, as well as encrypted file sharing. The Enterprise SDK also boasts a number of advanced features that aren’t commonly found in consumer-grade messaging systems. On the IM front, there’s the ability to edit, quote, delete, and retract text messages — essentially granting users full control over what they send. There’s also location services, and custom statuses. These go beyond the iconic read receipts of the original Blackberry messenger, and can be tied together by developers into one coherent product. One BlackBerry representative gave the example of a delivery driver having an ‘E’ message status when the driver is en-route, and one that says ‘A’ when he had arrived. BlackBerry is also emphatically targeting the healthcare market, and as a result BBM Enterprise SDK entirely HIPPA-compliant. So far, there’s no word on how much this will cost, although BlackBerry has confirmed it intends to offer it as a subscription product. By creating a system that’s secure, scalable, and brandable, BlackBerry may have realized that goal.